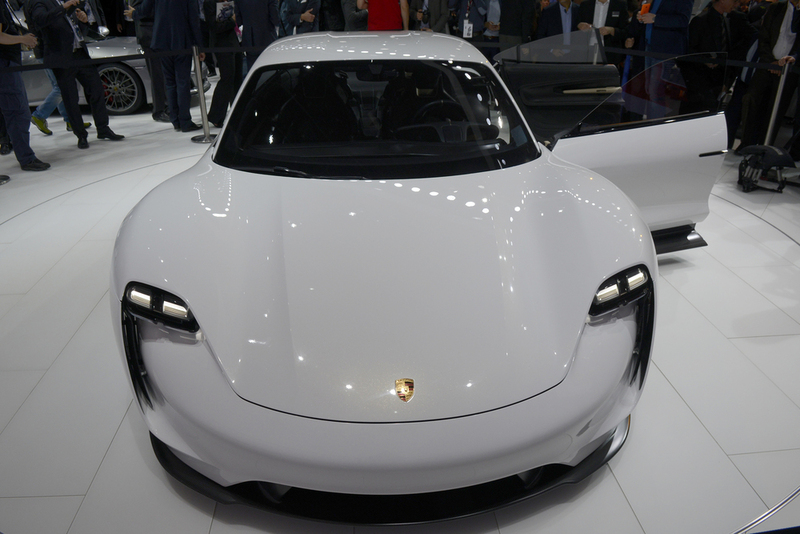 Porsche has revealed a new four-door electric car - the Mission E concept - in Frankfurt. 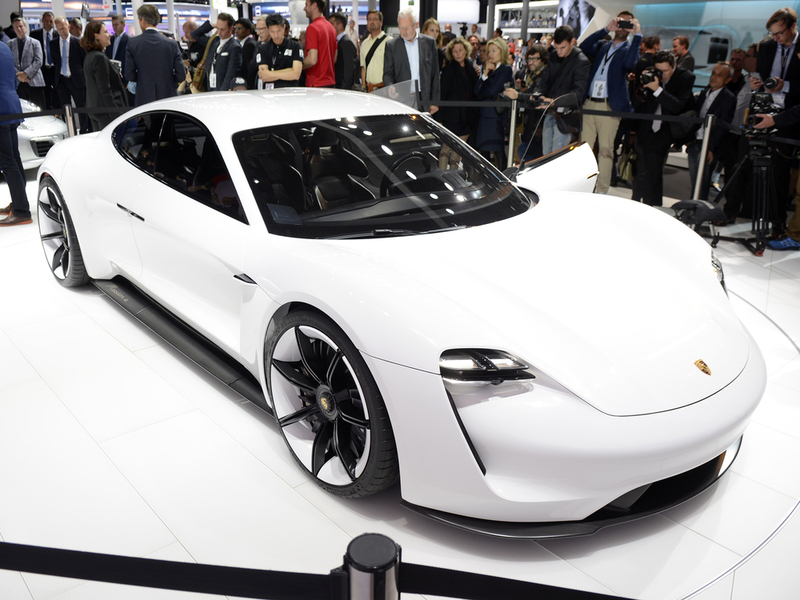 The Mission E shows how Porsche envisions the future of the electric sports car and is the first all-electrically powered four-seat sports car in the brand's history. The design of the Mission E bears many references to the 911 and remains easily identifiable as a Porsche at first glance. The all-wheel drive concept features a total power output of over 600hp, with a driving range of over 310 miles. The drive system of the Mission E is entirely new with two permanently-excited synchronous motors (PSM) - similar to those used in this year's Le Mans victor, the 919 hybrid - accelerating the car and recovering braking energy. 0 to 62 mph takes under 3.5 seconds while an innovative 800-volts battery charging system - Porsche Turbo Charging - reduces charging time to just slightly longer than it takes to fill a car's fuel tank today. At the quick charge station, it takes just over fifteen minutes to provide enough charge for around 80 per cent of the total range. As an alternative, the technology platform can be connected to a conventional 400-volt quick-charging station, or it can be replenished at home in the garage via inductive charging by simply parking over a coil embedded in the floor of the garage from which the energy is transferred without cables to a coil on the car's underbody. The control and display concept is intuitive with eye-tracking and gesture control as well as innovative functions. The driver's display is curved, low-profile and free-standing. The instrument cluster shows five round instruments - they can be recognised as Porsche, but they are displayed virtually in OLED technology - organic light-emitting diodes. The round instruments are organised according to the driver-relevant themes of Connected Car, Performance, Drive, Energy and Sport Chrono. The car's body as a whole is made up of a functional mix of aluminium, steel and carbon fibre reinforced polymer. The line of the side windows is also similar to that of the 911, however, with one important difference: two counter-opening doors enable convenient entry - without a B-pillar. Another difference: instead of the classic door mirror, inconspicuous cameras are mounted on the sides that contribute to the car's exceptional aerodynamics. The Mission E runs on carbon, 21-inch wheels in front and 22-inch wheels at the rear. The much reduced sculpting of the front end shows a classic Porsche 'sweepback', while the rear design underscores typical sports car architecture. The lean cabin with its accelerated rear windscreen, which draws inward at the rear, creates space for the sculpted shape of the Porsche rear wings. A three-dimensional "PORSCHE" badge illuminated from inside 'hovers' beneath an arch of light that extends across the entire width in a black glass element.